Bullet journalling is a new passion of mine. It's purposeful and I enjoy it because it includes things that I like along with the need to be organised. I love calligraphy, I love being creative and of course, I love stationery too. So, when I was given the chance to try out a new dotted journal, I took it. 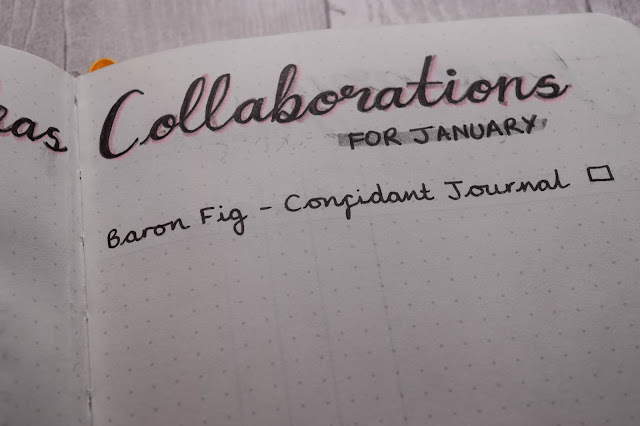 Today I'm looking at Baron Fig's Confidant Notebook which I've started using to organise my blog. This notebook isn't supposed to be just any notebook. This notebook has been designed to suit the everyone and their notebook needs. 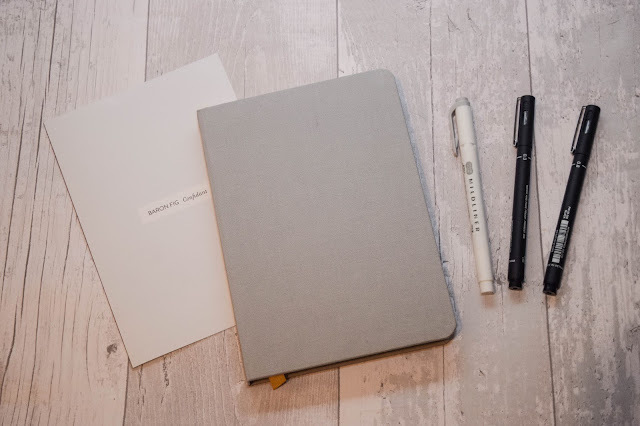 The Confidant comes in two colours (light grey and charcoal), three sizes and three different types of page to suit you and what you want from your journal. I have the light grey, dotted notebook in the flagship size - which is basically A5/medium. 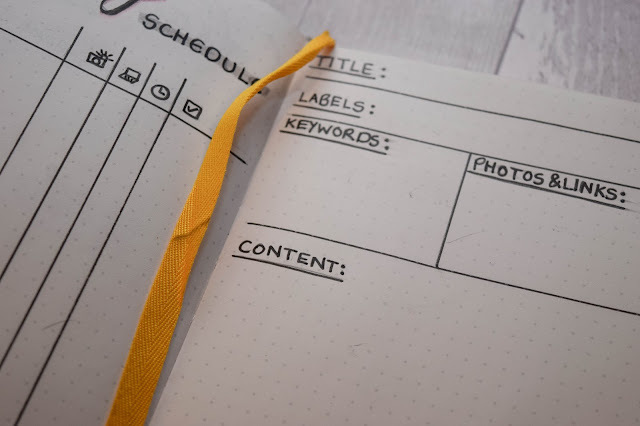 The notebook is designed to lay completely flat so that your pages don't curve and with perforated pages so that you can rip out any pages without the guilt or worry of ruining your notebook. The paper is of high quality and the hard cover is kept simple to keep it versatile and sophisticated. Now, that's a lot to say about a notebook so I was excited to try this out for myself and see if it lived up to it's expectations. For that, I wanted a purpose for this notebook and I decided I wanted to use it to support my blog and keep organised away from the computer. 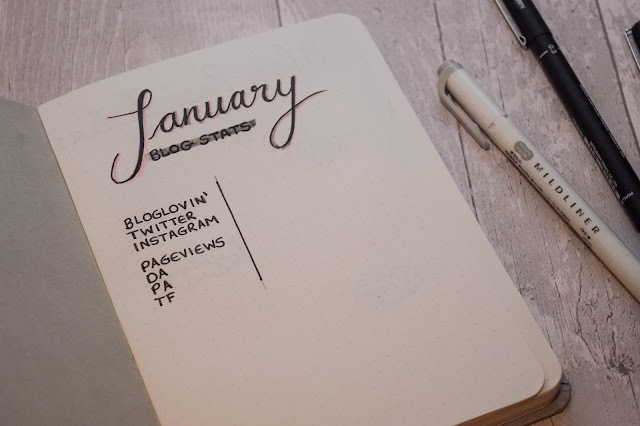 So, it's become my Blog post planner mostly, but also a place I could jot down ideas, note collaborations and stats and also plan my posts. When I received the notebook my first thought was, "ooh, posh", simply because it came boxed and with a little leaflet all about the notebook. I loved how the notebook was packaged and it shouted 'high quality'. I'm not a hardback kind of gal when it comes to notebook (at all) but with this in mind I didn't mind that it was a hardback. I don't know what I've got against them, but they're not usually my notebook of choice. The journal is covered in a light grey fabric which is nice to the touch, looks good and is of high quality, but I am worried about it getting dirty and not being able to clean it up because it's fabric. It also has a yellow fabric bookmark to help find your place that contrasts with the notebook quite nicely. I use these a lot so I love it when I notebook has them integrated. As for the pages, they definitely live up to the expectation and are high quality paper. It was so lovely to write on and the dots are faint enough to hide but easy enough to navigate around. I did think at first that the dots looked a bit too big compared to other dotted journals and I didn't like that, but I got used to it quickly and I stopped thinking about it. I did think the gap between dots made it easier to write in without feeling like I was making my handwriting smaller, which I really enjoyed. 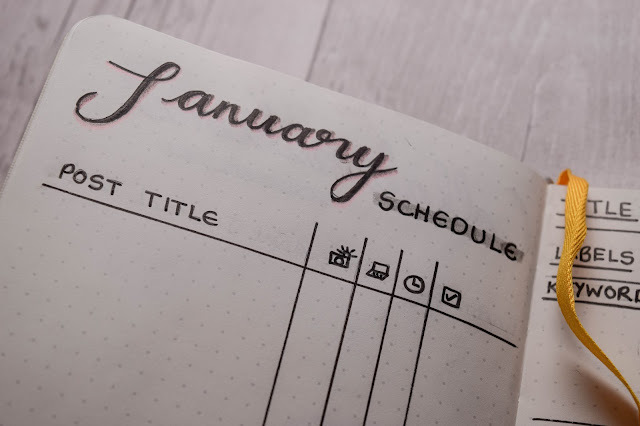 It felt easy to write in without the worry of not being able to squeeze it in as I do with my bullet journal sometimes. 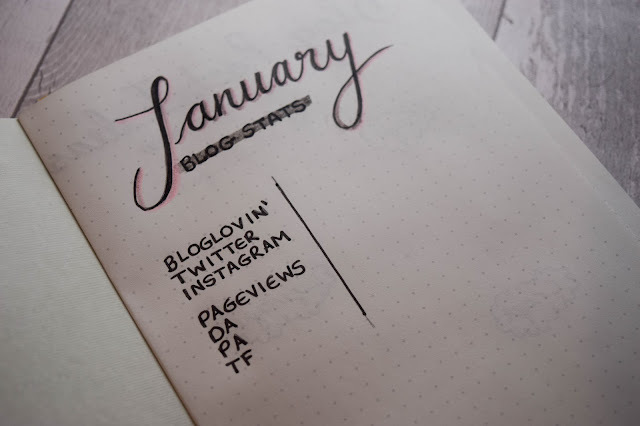 On the page above, I decided to go for a pretty page to log my blog stats at the end of the month. I left more space at the bottom in case there was anything else I wanted to track too. I was thinking maybe a blog post page views chart or something. What would you use that space for? I felt like the real test of how flat the notebook sat would be when I started working on the left hand page. I turned the page and yes, the notebook did sit flat but I wouldn't say completely. I'd put it mostly down to the fact that it's brand new and is the first page but there wasn't much curve to the pages as promised. It was easy to write on from edge to edge as you'll see with the grids on the next few photos. 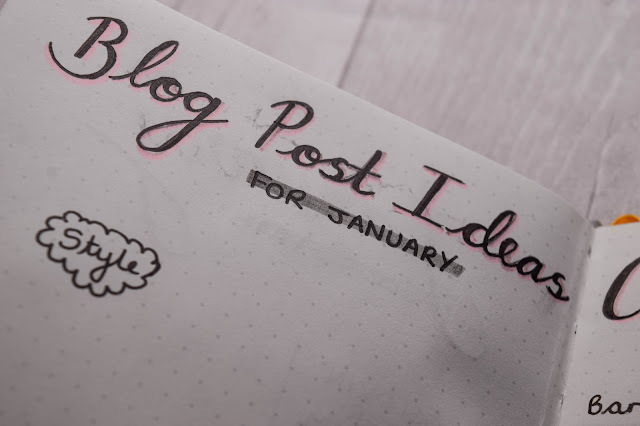 In these two pages of my blog planner I added a page for blog post ideas and a few category bubbles to get me started. 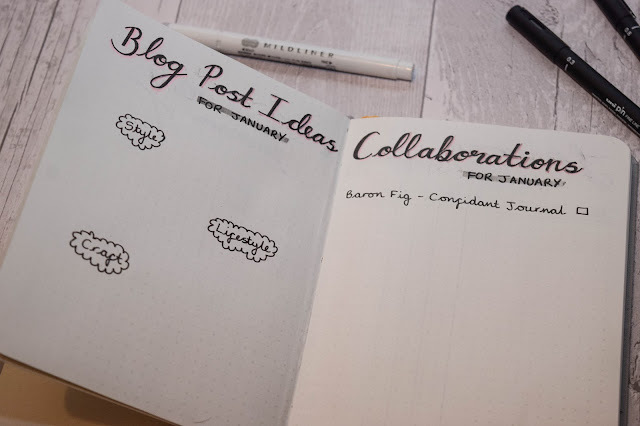 I also added a page where I could organise any collaborations for the month. Sometimes I get a few and sometimes I don't get any at all so I'm not sure how useful this page will be but I'll make as much use of it as I can! It's all trial an error when you lay the journal all out yourself. 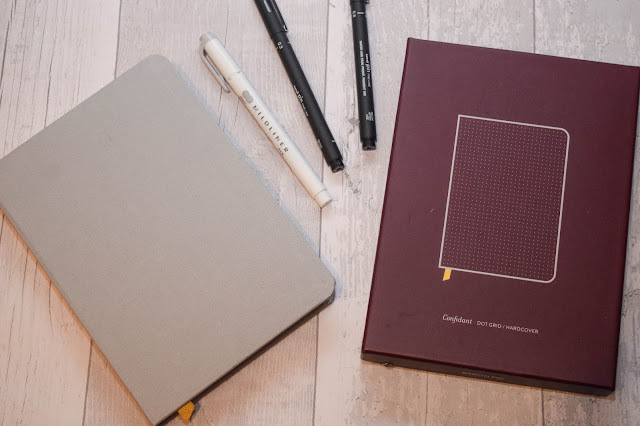 As before, I was looking to see if anything Baron Fig said about the notebook's features rang true or if they didn't. But as I went through drawing and using the notebook as I would with others, I couldn't find any faults or any falseness in what they wanted to give in this notebook. 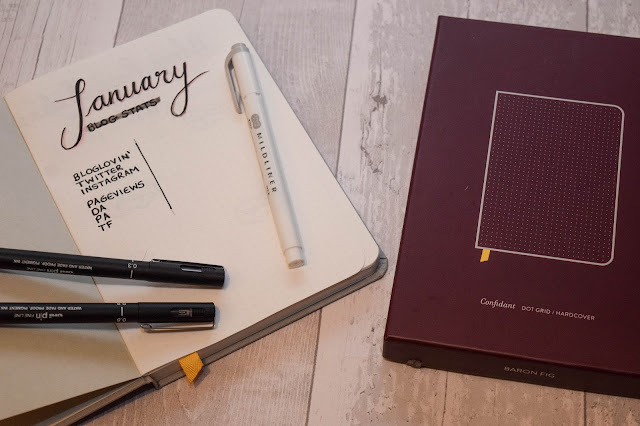 It's simply fantastic and I'm working well with it so far, and even though I wouldn't say it's my favourite ever notebook, I rate it as one of the best ones I've used so far. 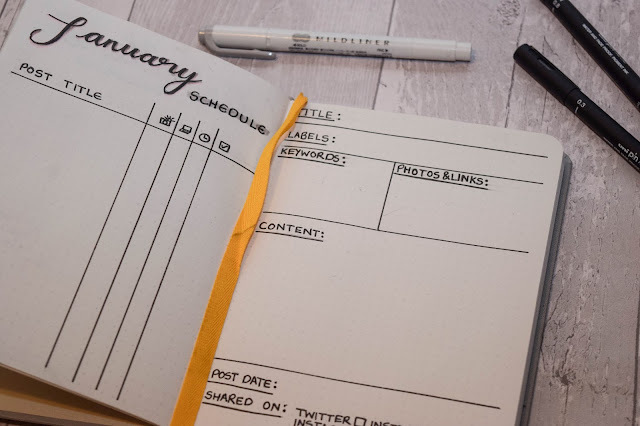 With all that said, it is good enough that I'll be using it as a blog planner through out the year and maybe even next year - even though it is a hardback! The Confidant notebook in the flagship size retails at $18 which is about £13.29. If you want a different size, the plus size is $22 (£16.25) and the pocket size is $12 (£8.86). 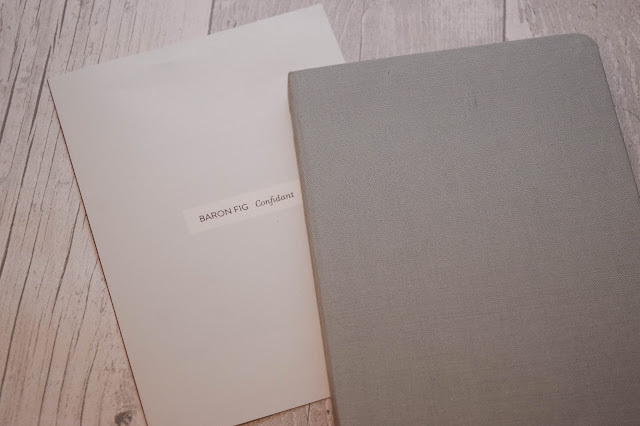 As far as I know you can only buy the Confidant notebook along with other notebooks on Baron Fig's website at the moment which means it'll be shipped over from the US which I know is difficult for us Brits but shipping isn't actually too expensive so it's quite reasonable if you're thinking about getting one!